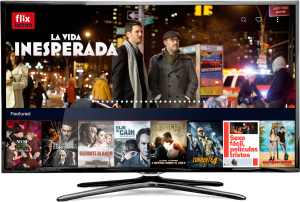 Oslo, Norway – November 14, 2018 – Vewd, the world’s largest OTT software provider, today announced that FlixLatino has certified its popular streaming app, making it immediately available for all Vewd-enabled devices and adding it to the Vewd App Store which can be found on a variety of connected TV devices from Sony, Samsung, HiSense, TiVo, Vestel, and many others. FlixLatino is a Spanish-language streaming video-on-demand service focused on the Hispanic market in the U.S. and Puerto Rico. For just $2.99 each month, viewers can enjoy more than 800 premium, theatrically-released films from Colombia, Peru, Venezuela, Cuba, Spain, and other Spanish-speaking regions. Vewd powers the world’s largest connected TV ecosystem – nearly 50 million Vewd-enabled devices ship each year. Content owners trust Vewd to bring their apps to devices from some of the world’s largest consumer electronics OEMs. FlixLatino is an Over-The-Top (“OTT”) Spanish language entertainment service providing consumers an App that gives them access to over 250 films, plus series and documentaries from throughout the Spanish speaking world. This service offers its audience the best contemporary Spanish content from all genres and for all palates! FlixLatino is brought to you by Somos Next, LLC, a member of Somos Group. You can learn more and visit SOMOS Next at www.somosnext.net. All product names and trademarks, registered or otherwise, are the property of their respective owner.